We made it! Are you ready for another beautiful room reveal?! I cannot believe that we finished this space in 6 weeks! This was the first One Room Challenge where I was really unsure if we were going to get it all done in time! But a few late nights and somehow we pulled it all together. 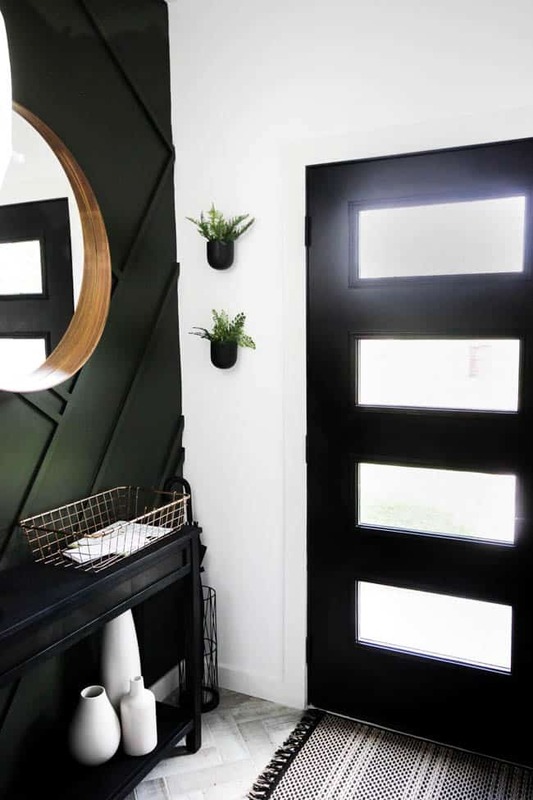 Our modern entryway is a dream come true for us! I can’t believe the transformation… but just to remind you… this is where we started…. Do you remember this space?! I barely recognize it and I lived in it! 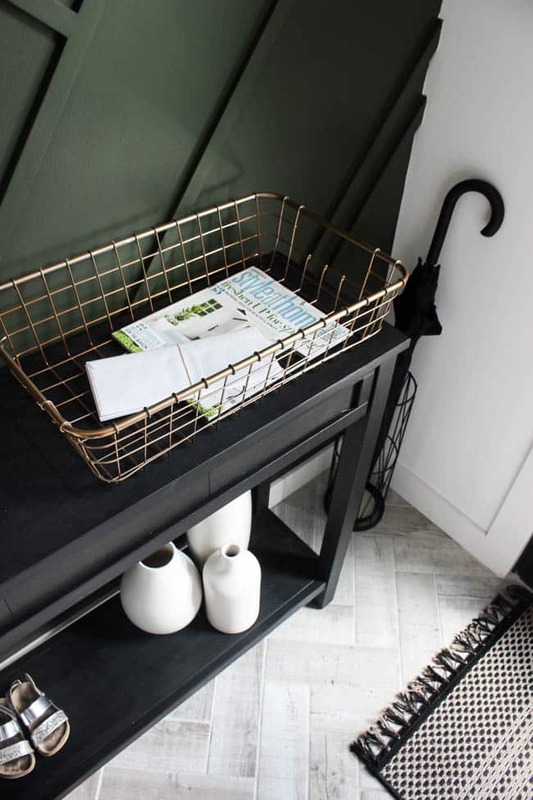 Let me introduce you to our new modern entryway. Starting with the beautiful new black front door! 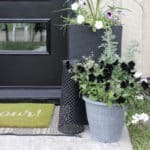 Last week we shared all about our front door installation, which was waaay easier than I thought it would be! The new modern door makes such a beautiful statement when you approach the home (I’ll be sharing some outdoor pics in an upcoming post!). 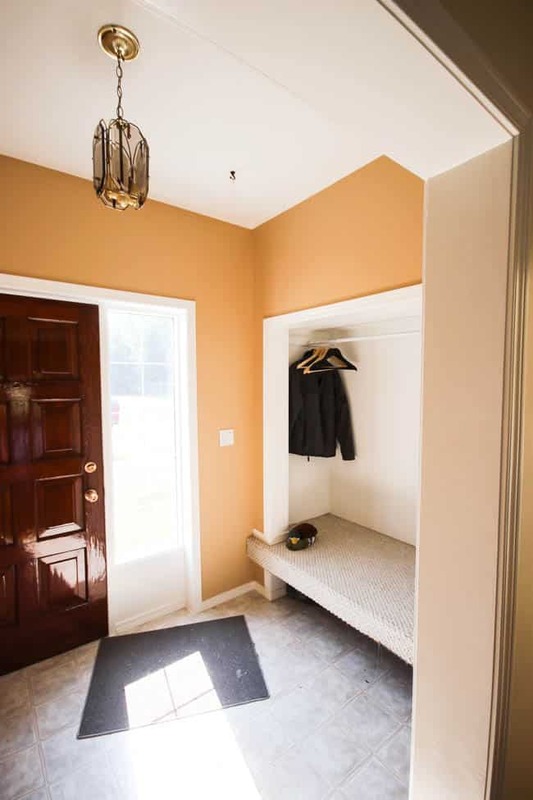 To the side of the front door, we completely revamped the existing closet and turned it into more of a mudroom! We tiled the bench with a beautiful dark basalt tile, added storage drawers underneath, and added new floating shelves and hooks. It’s a thousand times more inviting now! Saying, “come in… sit down.. take your shoes off on this comfy bench!” lol. 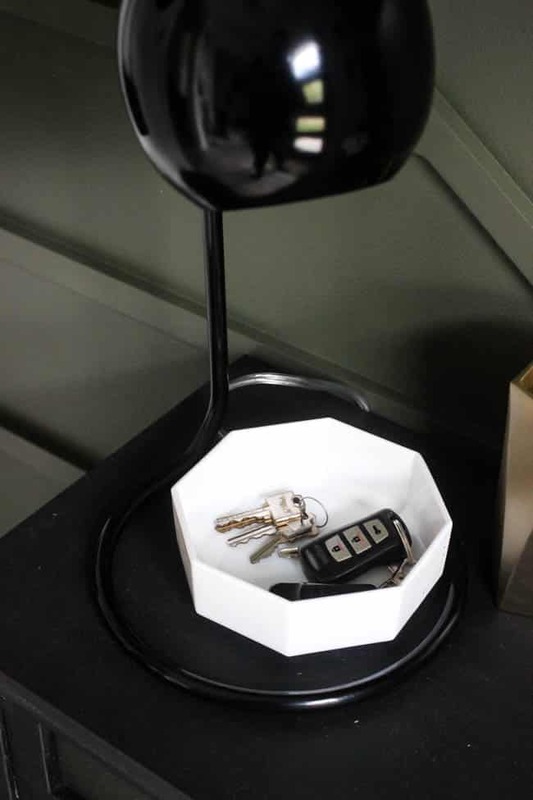 The artwork on the side is something I DIY’d quickly to fill the space and they look perfect! 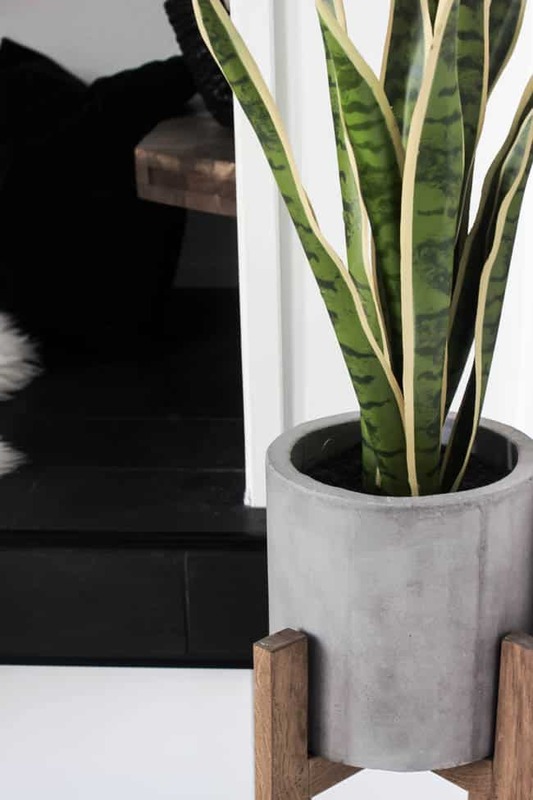 The beautiful wood and concrete planter is filled with real dirt, but faux greenery, lol. You know how bad I am at keeping plants alive, right?! And the flooring!!! Guys! I have dreamed about having beautiful herringbone floors for ages now and we finally got it done! We used this faux wood tile and I’m in LOVE! Plus we have heated floors in there now! My feet are going to thank me when our freezing cold Canadian winters hit! 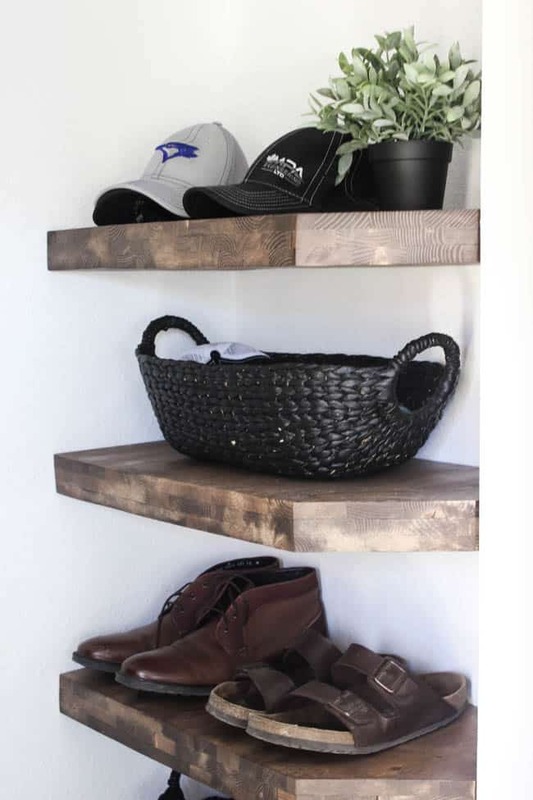 Remember the wood feature wall we were planning for our modern entryway? We got it built, puttied, sanded, and painted (thanks to my friend!) all in the last week! 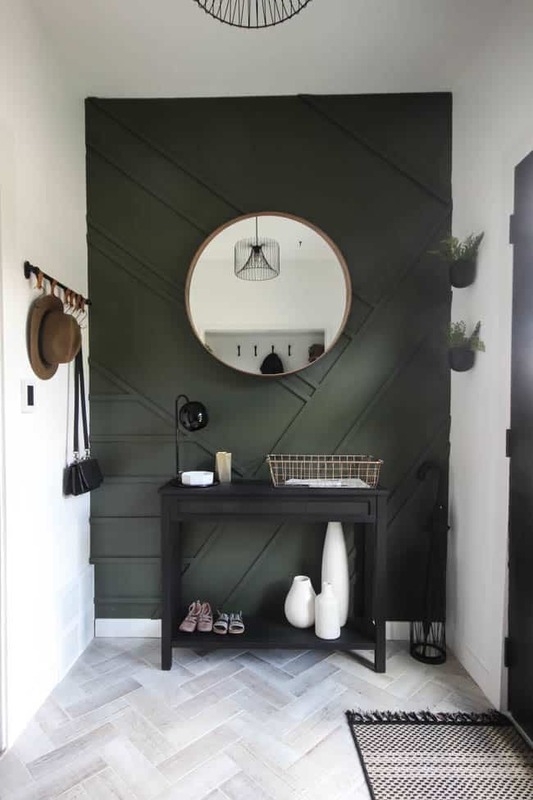 And how good does that faux wood tile look against the green wall?! A big round mirror and some stylish decor pieces really finished off this space beautifully. Not to mention the narrow console table that we’ve had for ages! We finally gave that piece a makeover and found it a permanent home. 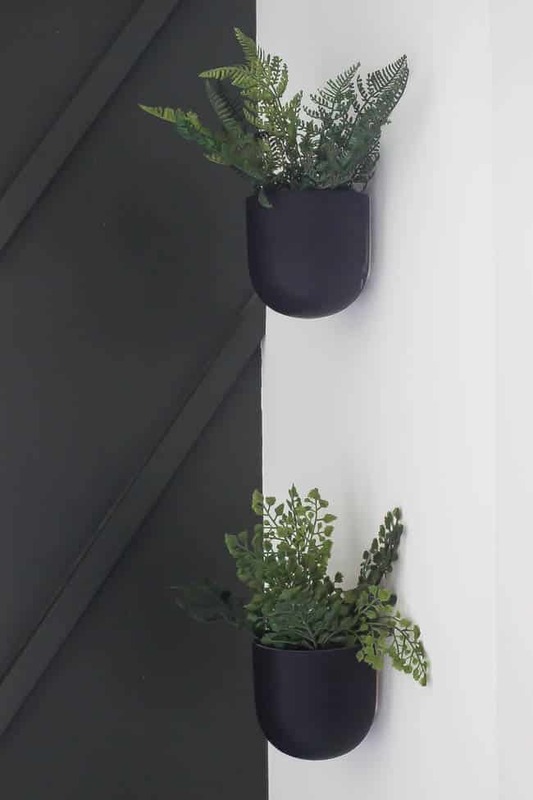 The black hanging planters are also filled with faux greenery (my favourite kind! ), in the form of little ferns. I hope you love the space as much as we do! This One Room Challenge was a real challenge, lol. But we’re more than thrilled with our new modern entryway! Oh my goodness, Lindi, it is just BEAUTIFUL! 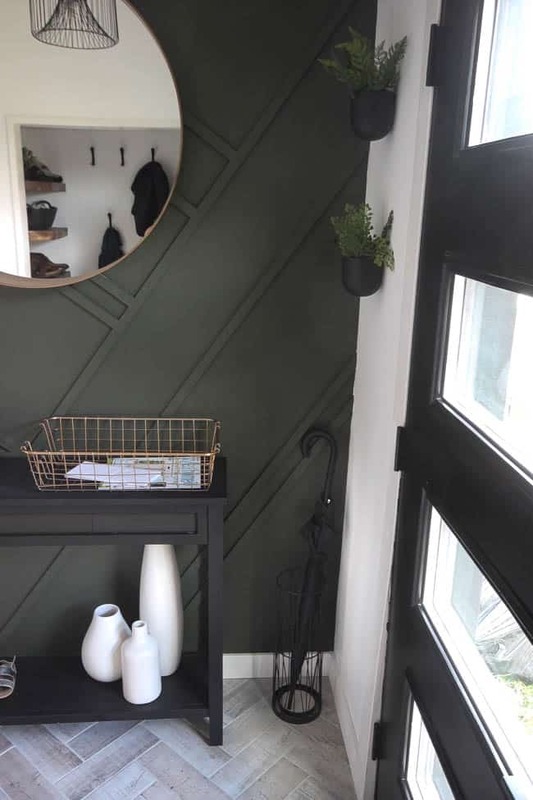 I absolutely love everything about it – that accent wall is incredible, the bench looks amazing and that front door is to DIE for! It looks amazing! I think you did a great job!! And everything just works together perfectly. It must be so nice to have a nice flow of all of the new changes in the house, right from the entrance to the living room! :) I can’t wait to see the finished product in person. Wow! An unbelievable transformation! Congratulations! I love it! It’s so nice to see you make your new home “yours”. Wow! It looks so good!! ❤️❤️ I love it! I would say it all looks really good, the only thing that seems to be missing is a rod to hang the coats? 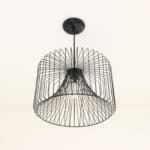 Maybe located at the top, powder coated black, made out of industrial pipe with flanges? Other than that the space is perfect ! Wow Lindi it turned out amazing. I think the new feature wall is my favourite. The wood detail is so cool, and the colour looks amazing. Great job! AMAZING!! Lindi you blow me away! All this while pregnant?!? That accent wall might be my all time favorite. You know I love your door, but I also love how you updated the closet. It’s all just too good. Congrats!! Looks fantastic! I love how you implemented the shelves! 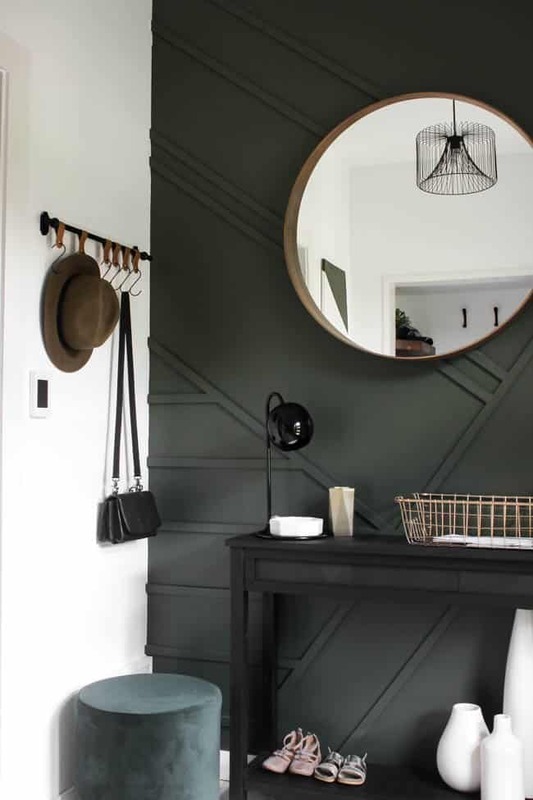 This looks so great – and the panelled wall is dynamite! 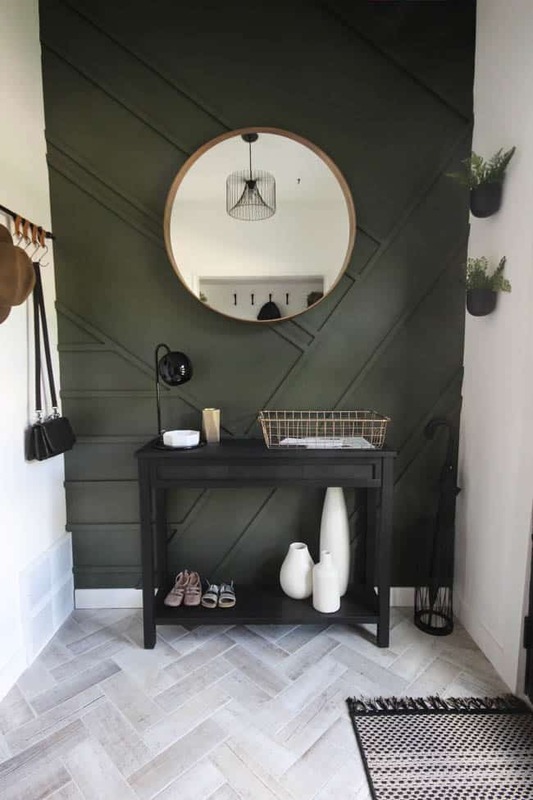 Love that accent wall and the door! You use black so well. It’s a gorgeous entry! What an amazing transformation! And I love how functional you made everything, while still being beautiful! Linda your entry is gorgeous!! That floor and bench area (Russel AKA the husband, you are hilarious…you did a great job by the way!). 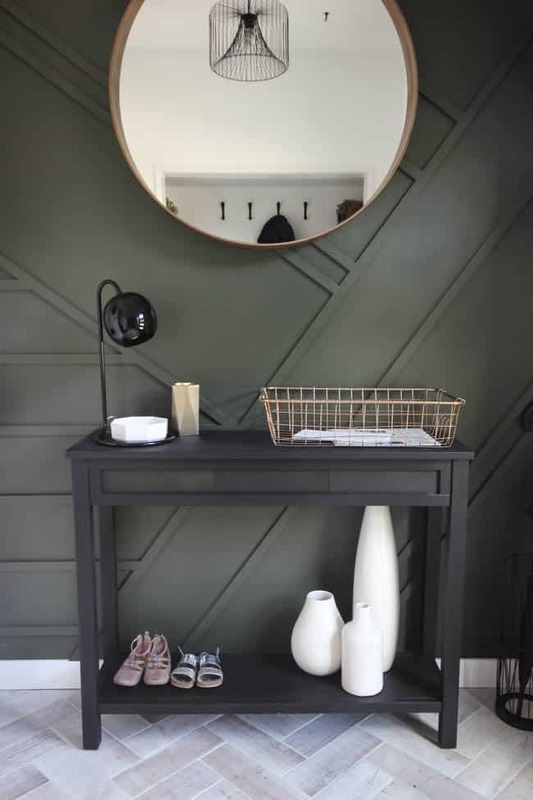 That door is a show stopper and that feature wall opposite your bench…PERFECT!! 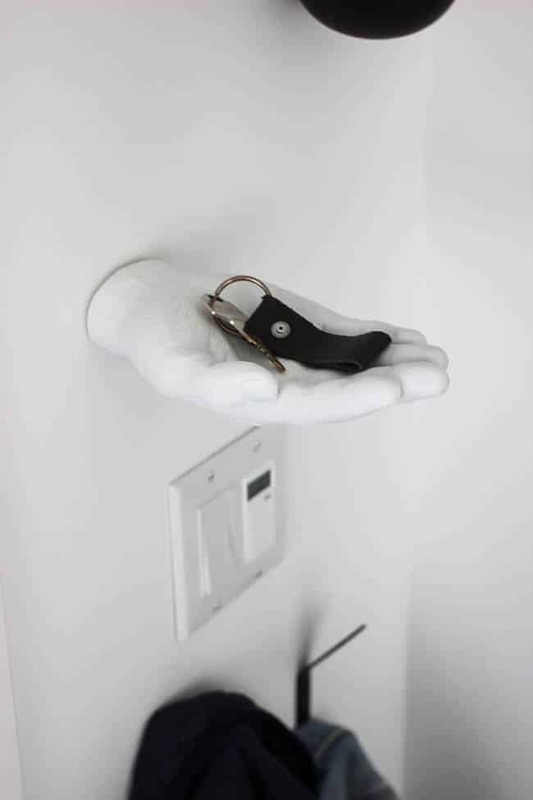 All your details just blow me away….love that hand holding the keys (I think every house should have one of those!) Great job and congrats on an amazing makeover!! Lindi…not Linda, gahhhh I hate autocorrect! Not only did you make it but you nailed it! Love this modern look! Loving that new front door! What a show stopper! Once again y’all have done an amazing job with a huge project! 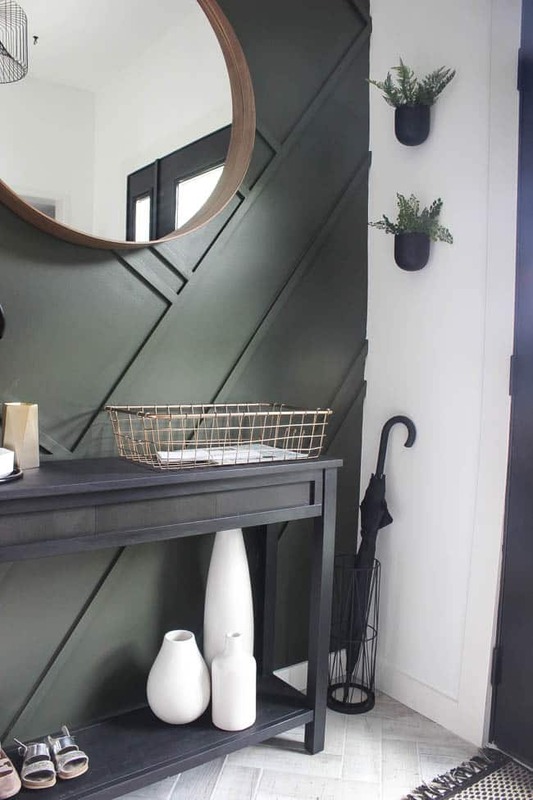 This is more than just an entryway! 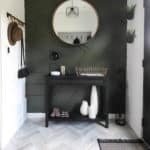 Beautiful makeover – love the tile, design, functionality, thought to detail! You should be proud! This is gorgeous! I love it so much! I really really love that floor. I just love it. There is so much going on, in a good way, I’m such a small space! Congrats! Shut your mouth…I love everything about this. This turned out SO good, but it should be no surprise that I like something you’ve done. Loooooooooooooove it. If we didn’t have HOA rules about front doors, I would be getting that door yesterday. I can’t pick what I love most: the green wall treatment, the chandelier or that front door. 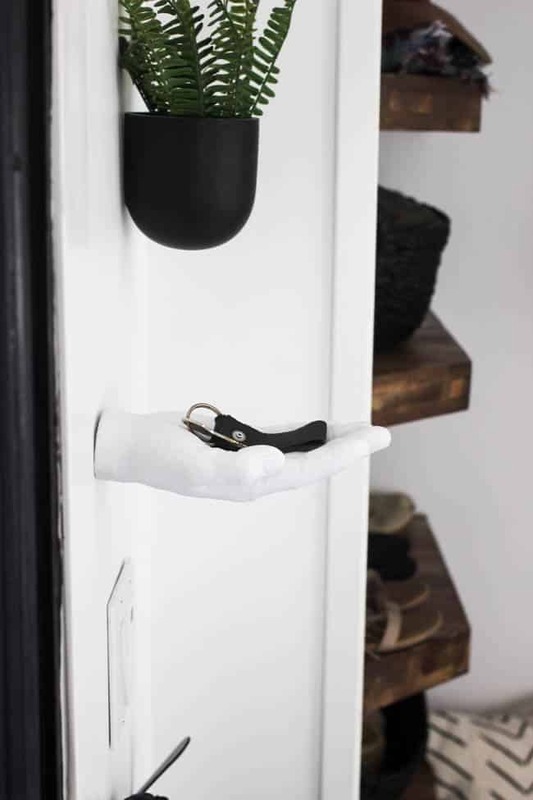 The hand shelf is also so quirky and unexpected! I just love it!!! Sigh – so beautiful! 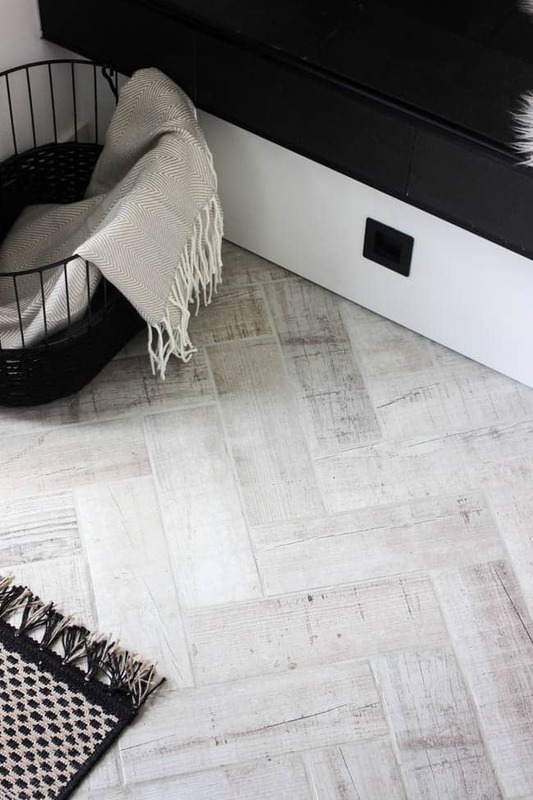 I can’t decide which part I like the most – the herringbone floor (swoon!) or that magnificent feature wall! I love, Love love this space! Love everything about this, so gorgeous! 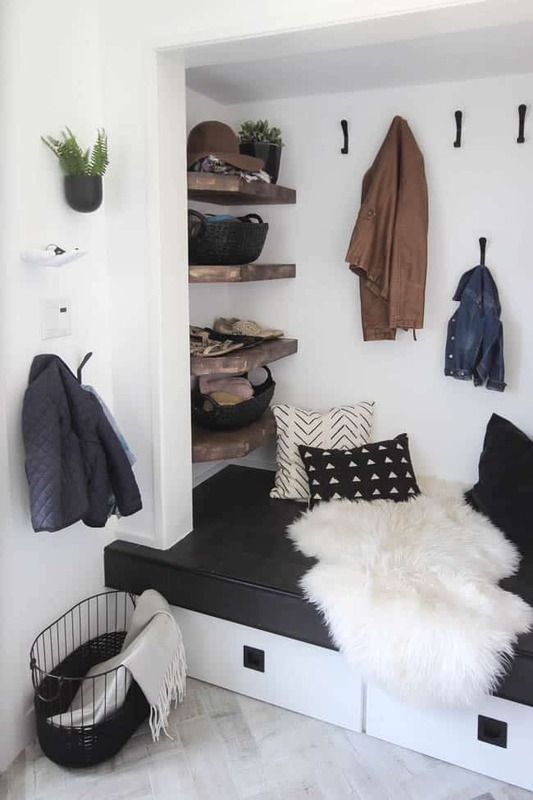 Such a great use of your entryway space! 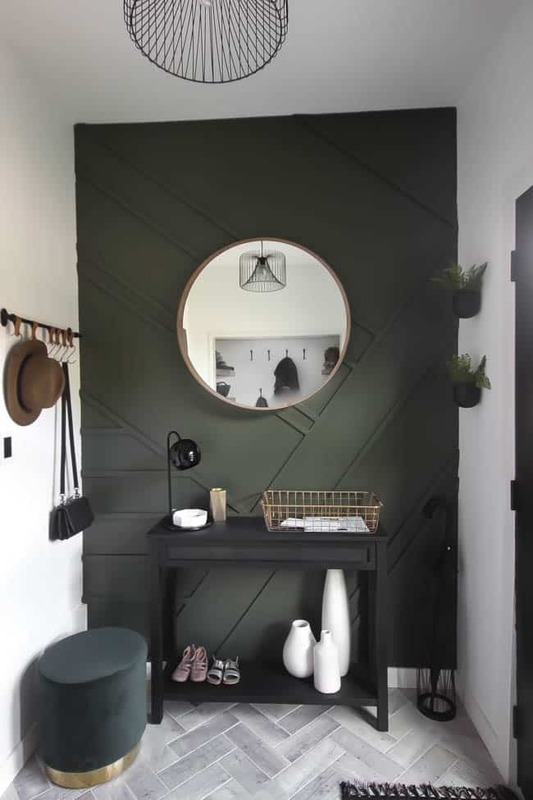 I love the way you made over that bench area, and that accent wall is AMAZING – both that wonderful deep green and that pattern make your space so special! Wow Lindi! Your space is amazing! 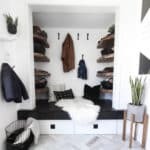 I love the feature wall and the bench and shelves turned out perfectly! OMGggg – Fabulous Darling … Just Fabulous!! I seriously LOVE your style, and this makeover is no exception! The floors are absolutely GORGEOUS, great job on the makeover! I love everything about this Lindi!! Well done – and pregnant too! Heated entry floors sound dreamy and I’m obsessed with that flooring. 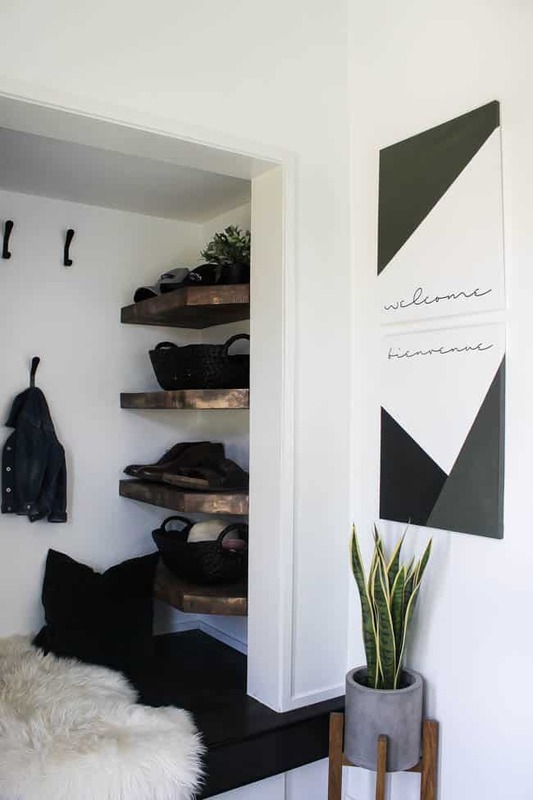 Thanks for sharing your entryway makeover with us! wow! that door, that light, those shelves, that TILE! It’s all so pretty. great job! This turned out SO GOOD! 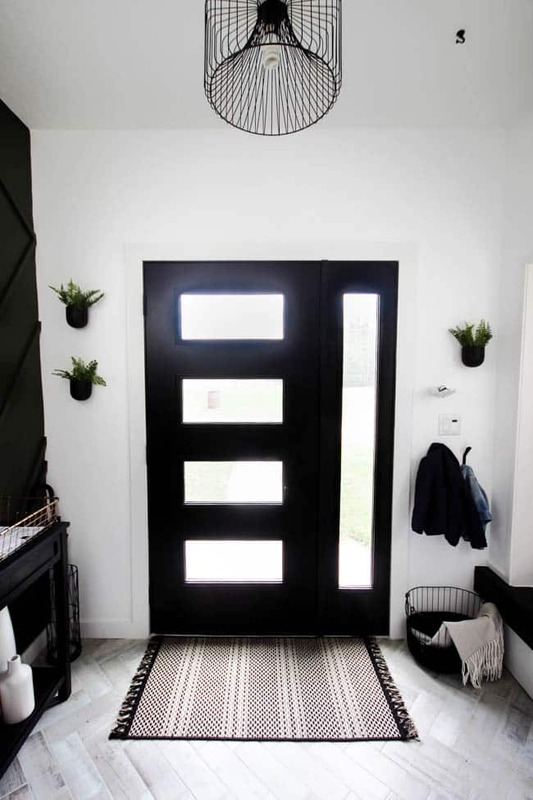 The accent wall is gorgeous and that door is everything I have always dreamed of! Beautiful job! It’s so SO stunning!! I absolutely love every inch of it. 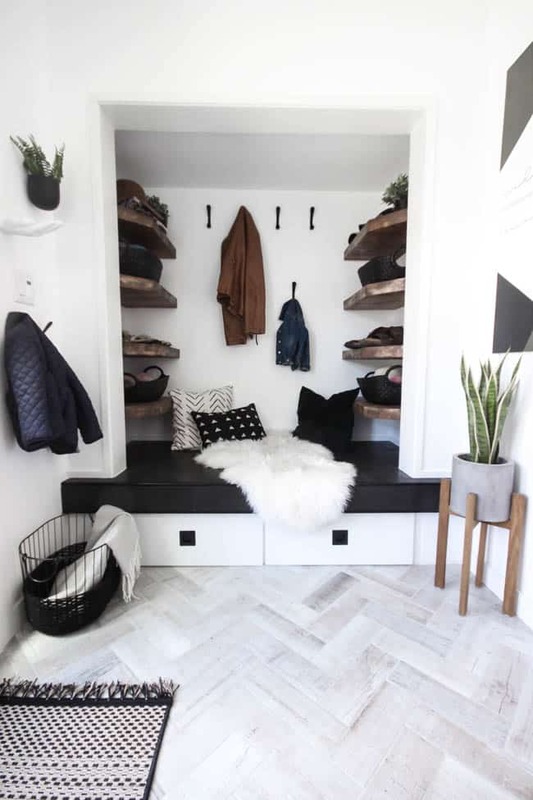 From the herringbone tile, to bench to the feature wall & that door! Wow! You accessorized it perfectly too. And I can’t believe you got all that done so close to your due date. Truly amazing. You guys should be super proud! Not surprised at all that you knocked this out of the park! I love it all, the style, the colors, door and the nook…amazing! Great job friend! What!!! This is breathtaking! Your feature wall is amazing, and I love the moody feeling of the dark walls, offset by all that natural light. Just incredible! I’m so in love with your feature wall and to top it you actually made it happen a week-wow!!!!! I followed your post on the bench and loved every step of it , the door is stunning- I am in love with the entire space !! You absolutely nailed it to perfection !! 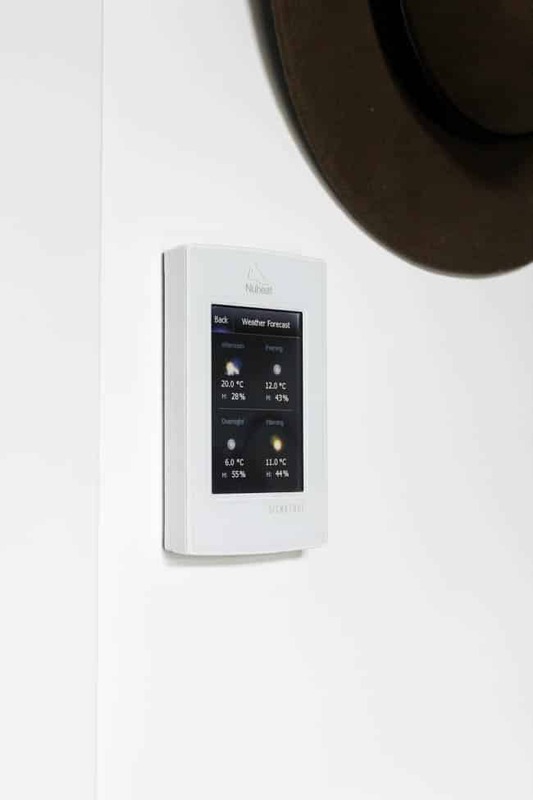 That wall panelling is VERY cool! 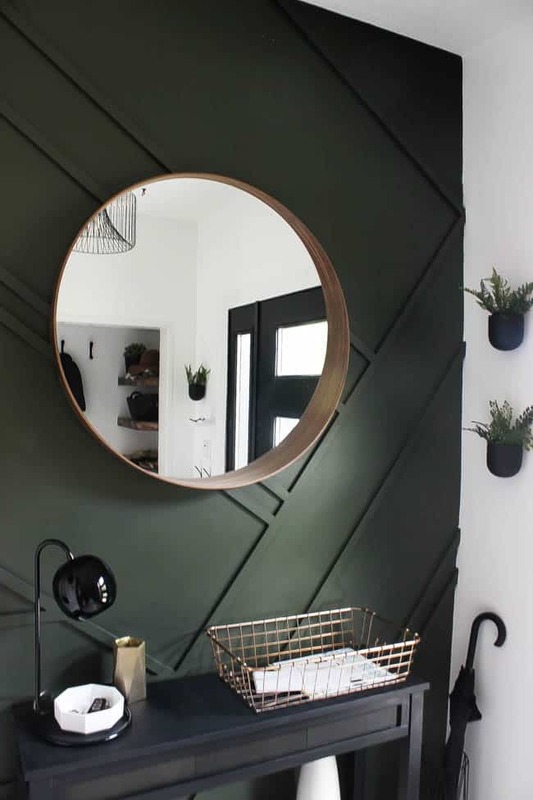 Love the green with the black accents too. 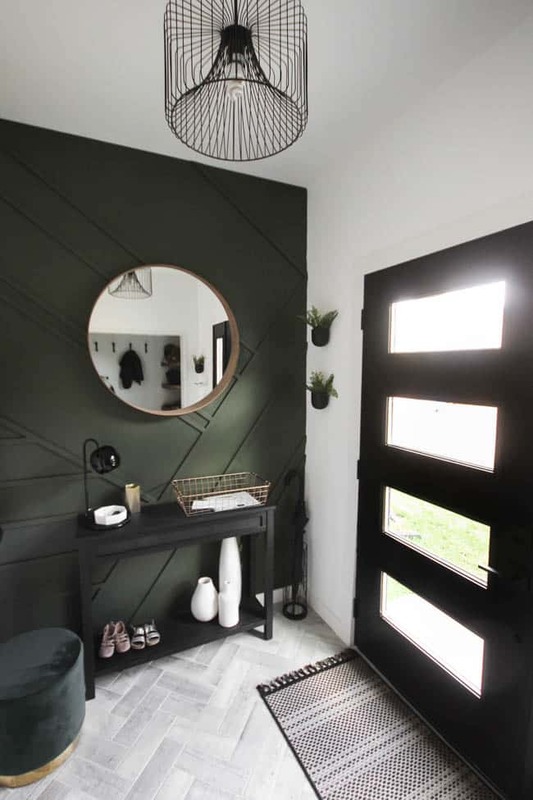 I love how modern your entry is now! That door is gorgeous! But that floor!! And the hands are so fun! Your entry is gorgeous! It’s hard to pick a favorite part but I’d have to go with that beautiful heated floor! Congrats on a job well done! You did a fabulous job! It is so unique, and that black bench area is the bomb.com! I love this so much! 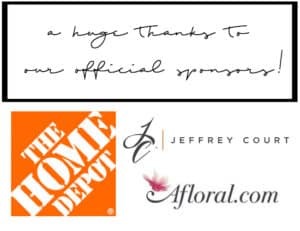 You did an outstanding job on every detail. I love how you took what wasn’t working well and made it not only function but functions fabulously! How hard was it to instal the herringbone tiles? I love that look!! Where is the hand from. Love it!! I just saw that door in orange at Home Depot and LOVED it!!! 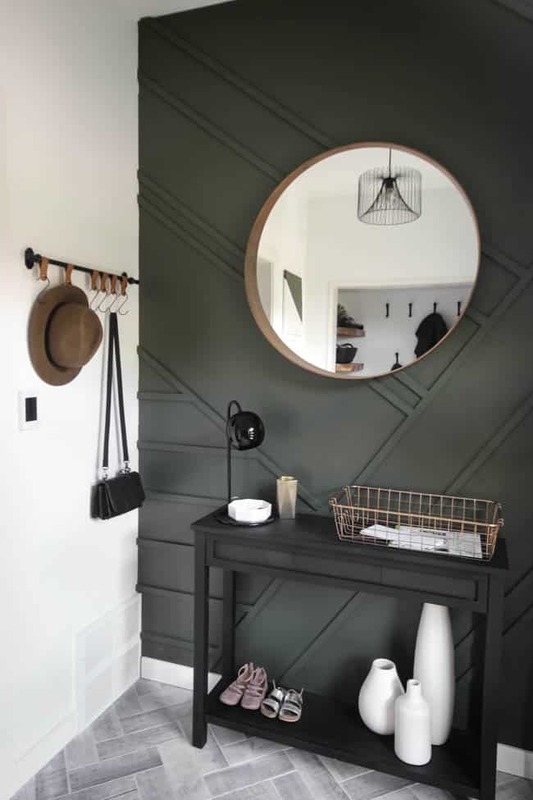 The herringbone was a bit of work – it was more complicated than we thought it would be, but if you’ve done tile work, you can tackle it! We hope to share a tutorial sometime soon :) There is a link to the hand in the bottom of the post under, “Shop this post”! I love that hand too! Isn’t the door stunning?? I’m so glad we bought that one! Beautifully done! Wondering what the green paint colour is. Thanks!